The Rangers and the Lightning will faceoff for one last time tonight at Madison Square Garden to decide who gets to play in the Stanley Cup Finals. Photo courtesy of MSG Photos. Following a valiant effort to avoid elimination yet again, the New York Rangers now have a chance to fight for a chance to return to the Stanley Cup Finals in front of their fans at Madison Square Garden. This crazy, unpredictable series will come to a close in the most exciting, nerve-wracking way in professional sports; Game 7. If there is one thing this series has been, it is unpredictable. The Rangers opened with a dominating 2-1 win in Game 1, controlling the play through most of the 60 minutes. Then the Lightning outgunned the Rangers in a 6-2 Tampa win in Game 2, taking advantage of power play opportunities and mistakes. Game 3 was an offensive outburst, ending in a 6-5 Lightning win in overtime. 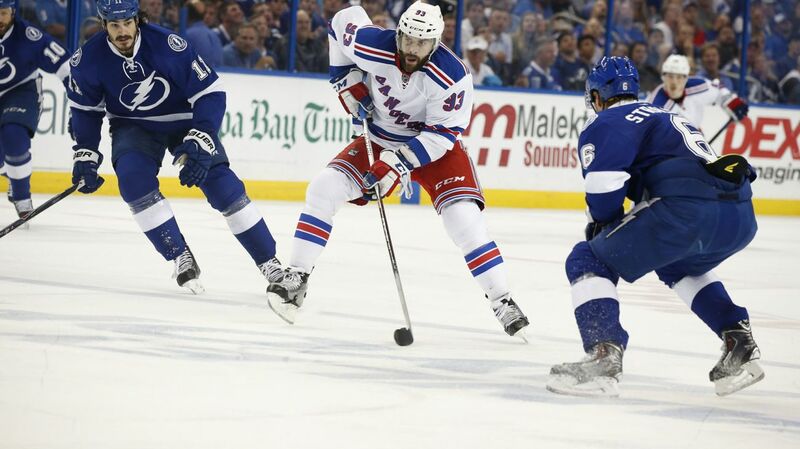 Then the Rangers outgunned the Lightning 5-1 in Game 4 to tie the series. Tampa came back to the Garden and played very defensively, shutting out the Rangers in Game 5. And then the Rangers forced a deciding Game 7 with another offensive explosion on Tuesday. As you can see, this series had absolutely no predictability. Nothing carried over from game to game, there hasn’t been one style of play, or one team scoring a lot of goals. Both teams have had their ups and downs, successes and failures, and that makes the buildup to tonight’s game even more unforeseeable. In a must win Game 6, staring down elimination yet again, the Rangers came out with a strong performance, scoring seven goals, chasing Ben Bishop, and getting tremendous production from the top line of Rick Nash, Derick Brassard, and JT Miller, who combined for 13 points. Derick Brassard had a hat trick and two assists to help guide his team to a victory in Game 6, and force a deciding game at Madison Square Garden tonight. Photo courtesy of MSG Photos. 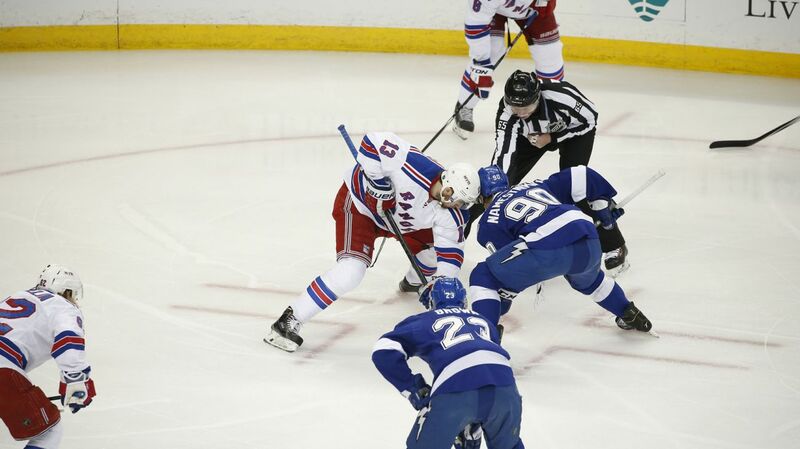 The Lightning didn’t play bad in Game 6 at all, but they let the Rangers play their style of game. Tampa had their chances, but New York seemed to have control of the first two periods. They kept the crease clear for Lundqvist, kept most chances away from the danger zones, and got a good performance from Henrik Lundqvist. The Rangers also used their size advantage and were more physical, which limited what the Lightning could do with their speed. Apart from his Game 5 shutout, where the Rangers never really challenged Tampa, Ben Bishop has been decidedly average. He hasn’t made many great saves in the series, and the Rangers have scored 15 goals combined in Games 3, 4 and 6, and Bishop hasn’t really been much of a factor in any of the Lightning wins. This is his first playoff run, and the biggest game of his career, so it’s up to him to prove if he can handle the pressure. In the last three games, the Rangers have done a good job of bottling up the triplets; Nikita Kucherov, Tyler Johnson and Ondrej Palat. Johnson, who leads the NHL in playoff goals with 12, has just two assists in the last three games, both coming in Game 6. Vigneault has paired the Stepan line against them for the most past, and it has worked. Still, Kucherov scored twice on Tuesday, and the Rangers will need to keep them off of the score sheet. The win on Tuesday improved the Rangers’ record in elimination games since the start of 2012 to a staggering 15-3, including four wins in these playoffs. The 15 wins when facing elimination since 2012 are the most that an NHL team has earned over a four year span in NHL history. Their record in elimination games and Game 7s when playing at the Garden is even more impressive. The Rangers have won their last 10 games at MSG when facing elimination, including two games against the Capitals in these playoffs. More impressive is their record in Game 7s on home ice, which is 7-0. Henrik Lundqvist has been a big, big part of the Rangers success in elimination games, boasting that same 15-3 record in elimination games since 2012, including the 10-0 record at MSG, and he’s one of only three goalies in NHL history to win six Game 7s. That’s amazing, but what is even more impressive is his stats in those games. Call him Mr. Elimination. Henrik Lundqvist is 15-3 in his last 18 elimination games, has won 10 straight elimination games at MSG, and has won his last six Game 7s. Photo courtesy of MSG Photos. In the last 18 elimination games, Henrik has posted a 1.47 GAA and a .954 save percentage, with two shutouts. In the last 10 elimination games at Madison Square Garden, he is undefeated, posting a microscopic .96 GAA and a .968 save percentage. 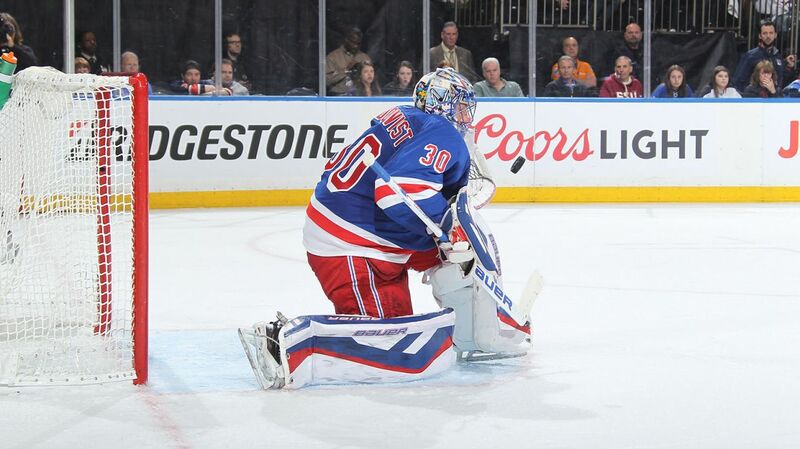 In Game 7s, Lundqvist has just a .81 GAA and .973 save percentage, and he has won his last six Game 7 starts. He has stepped up his game when his team needs him most, and he’ll need to do exactly that again tonight. Rick Nash (1-3-4), JT Miller (1-3-4) and Derick Brassard (3-2-5) all had amazing games on Tuesday night, marking the first time in franchise history that three Rangers have scored four or more points in a playoff game. The three Blueshirts were the first Rangers to score four or more points in a playoff game where the Rangers faced elimination since Mark Messier (3-1-4) in Game 6 of the 1994 Eastern Conference Finals. Miller really works well on that top line, and the Rangers will need the best from their best if they want to come out on top. 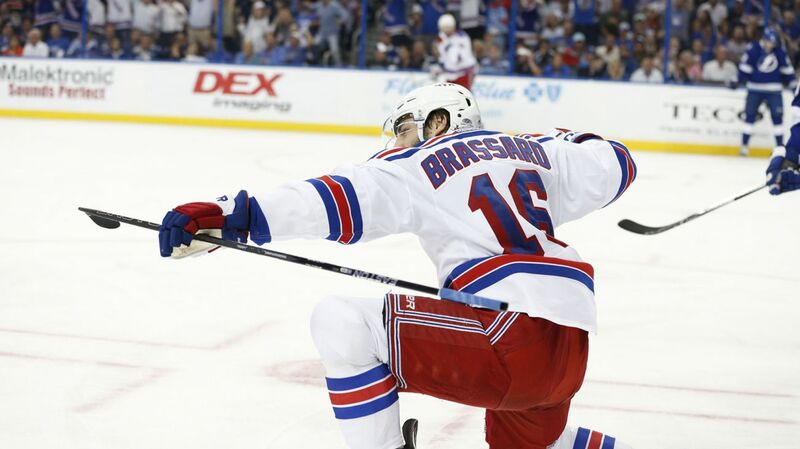 Derick Brassard has been a clutch playoff performer, and leads the Rangers with nine goals in 18 playoff games. Rick Nash has been very good in these playoffs, playing a great two-way game, and is second on the team in scoring (5-9-14). JT Miller scored his first career playoff goal, added three assists, and was a strong physical force. Watch out for these three. Keith Yandle has grown increasingly more comfortable as the playoffs progress, and is at home in the up-tempo style of play that has been commonplace in this series. He has seven points (2-5-7) in the last four games, including a huge second goal in Game 6. He makes great outlet passes, moves the puck well and can score some big goals. Keith Yandle has really settled in nicely, and is coming off a huge two point (1-1-2) performance in Game 6. Photo courtesy of MSG Photos. The stage is set for yet another nerve-wracking, intense, hard fought Game 7 between two really good hockey teams. The winner gets to fight for a shot at hoisting the Stanley Cup, and the loser goes home for the offseason. Posted on May 29, 2015, in Game Previews and tagged Alain Vigneault, Ben Bishop, Cam Talbot, Carl Hagelin, Chris Kreider, Dan Boyle, Dan Girardi, Derek Stepan, Derick Brassard, Dominic Moore, Hartford Wolf Pack, Henrik Lundqvist, James Sheppard, Jesper Fast, JT Miller, Keith Yandle, Kevin Hayes, Kevin Klein, King Henrik, Madison Square Garden, Marc Staal, Martin St. Louis, Mats Zuccarello, Matt Hunwick, MSG, MSL, New York Rangers, NHL, NHL 2014-2015 Season, NHL Playoffs, NY Rangers, NYR, Rangers, Rangers Nation, Rangerstown, Rick Nash, Ryan Bourque, Ryan McDonagh, Stanley Cup Playoffs, Steven Stamkos, Tampa Bay Lightning, Tanner Glass, The Ranger Zone, Tyler Johnson. Bookmark the permalink. Leave a comment.